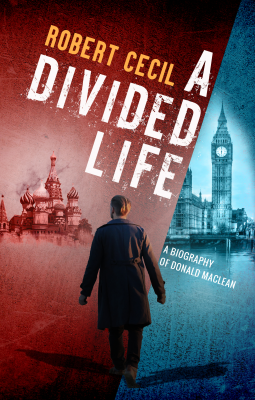 A Divided Life: A Personal Portrait of the Spy Donald MacLean by Robert Cecil is the biography of a British spy during the Cold War. Cecil served for thirty years in the Diplomatic Service, after reading History and Modern Languages at Cambridge. During the War, he was seconded for two years to ‘C,’ the chief of the Secret Intelligence Service. In 1968 he took up a Readership at the University of Reading, and from 1976 until retirement in 1978 he was Chairman of the Graduate School of Contemporary European Studies. Thinking back many Baby Boomers remember the Cold War and the feeling that it would last forever or until it became a hot war and ended the world. It seems almost inconceivable that the majority of the population under thirty-five has no recollection of the Cold War as many were not even born yet. Capitalism and Communism fought in many proxy wars from the end of WWII until the fall of the Soviet Union. It was a competition for supremacy of ideology. The majority of the world fell into one of the two camps almost without exception. Outside of the war-torn third world, national populations fell into clear-cut, homogeneous, blocks of one side or the other. It was hard to believe how one would give up their country and ideology and switch sides. Americans who did it rarely acted for ideology. The book and movie Falcon and the Snowman reflected excitement and rebelliousness of the two young men. John Walker sold secrets for money. The Rosenbergs might have truly been ideological supporters; they had been members of the communist party. In Europe, things were a little different. Communists had a history in national and international politics. Communism was more closely associated with labor and worker’s rights and the antiwar movement. Cecil was in a unique position of knowing and working with MacLean and relates a more personal look at one of the people who became one of the Cambridge Five. The Cambridge Five passed information to the Soviet Union during WWII and afterward until the early 1950s. The members included MacLean, Guy Burgess, Anthony Blunt, John Cairncross, and Kim Philby. MacLean disappeared in 1951 and defected to the Soviet Union. He remained “missing” for five years until Kruschev finally admitted to the defection five years earlier. MacLean would become part of Soviet society earning a Ph.D. and working with the Soviet government in areas dealing with the West. It is difficult to believe that someone who embraced the ideas of communism would also adopt the dictatorship of Stalin and not recognize that even after Stalin, the USSR was not a workers paradise or even remotely close to anything Marx wrote. The author’s relationship with MacLean creates a warmer biography of a human and not an ideologue. The writing seems fair and without apology, but it explains some of the why, and how someone from a well-off background would leave it behind for a system the only nominally supported his political views.